A lazy Sunday brunch favourite, the bread I used here was the Artisan loaf from Bakels Gluten free range. It’s super simple to make and tasted delicious in this recipe. – In a shallow casserole dish pour the almond milk, agave, chia seeds, salt and cinnamon. Stir and allow to sit for 20 mins so the chia seeds absorb some of the liquid. – Place the bread in the milk chia mixture and allow it to soak up some of the liquid in both sides. -Melt a tablespoon of coconut oil in a frying pan on a medium heat and fry the bread on one side for 2mins before flipping over and allow the bread to cook on the other side for another minute. -Remove the bread from the pan, place on a plate and cover with tinfoil to keep warm whilst you repeat the above steps for the remaining slices. 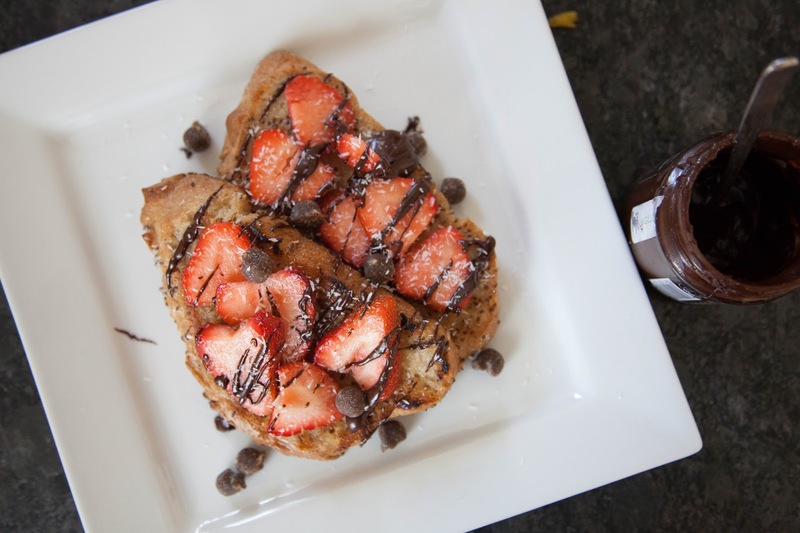 – To serve I drizzled with some chocolate spread, sliced strawberries, desiccated coconut and some nakd caramel nibbles.